Roond, white background, reid border wi the inscription: "República del Paraguay", tae the left a green palm branch an tae the right a green olive branch, an baith ar tied thegither. In the middle thare is a five-pynt yellae star. 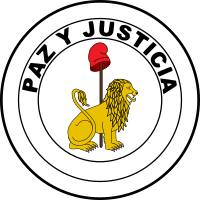 The Reverse o the Arms features a lion, in front o a staff an leeberty cap, wi the inscription "Paz Y Justicia", meanin "peace an justice". 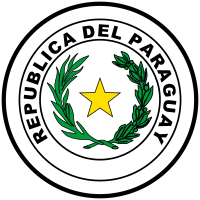 While probably maist prominent on the reverse o the naitional banner, reverse o the seal is an aa uised bi the Supreme Court o Paraguay, an is featurt alangside the obverse on banknotes o the naitional currency, the Guaraní. The first design o the coat o airms dates tae the year 1820, frae the time o the dictatorship o Francia.